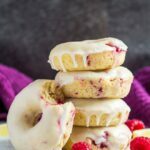 Baked Lemon Raspberry Doughnuts – Deliciously moist and fluffy doughnuts infused with lemon, stuffed with raspberries, and dipped in a sweet lemon glaze! 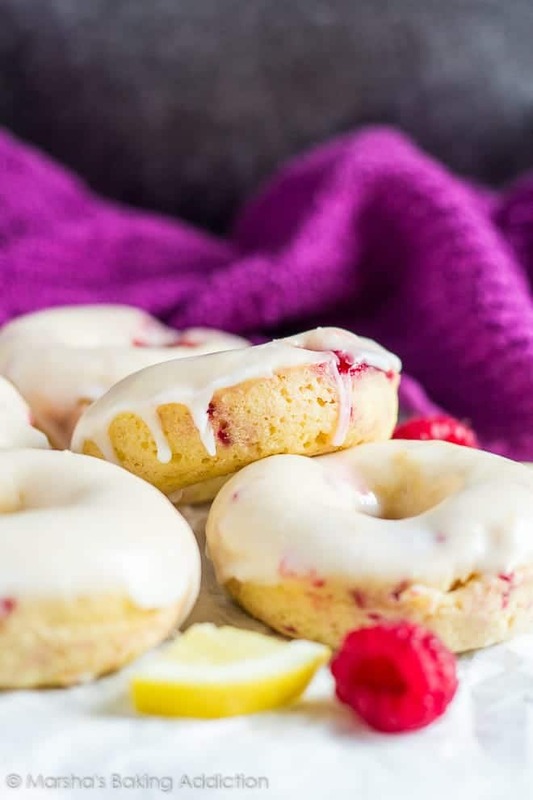 So, today I’m bringing you a new lemon raspberry recipe – Baked Lemon Raspberry Doughnuts! These doughnuts are BAKED, not fried, meaning you can have more than one without feeling extra guilty. 😉 These are also super quick and easy to throw together. 10 minutes mixing the ingredients up, 10 minutes in the oven, then allow to cool before dipping in glaze. Done! Lemon and raspberry fan? Then you are going to love these doughnuts. They are bursting with just the right amount of flavours! More baked doughnuts to try! 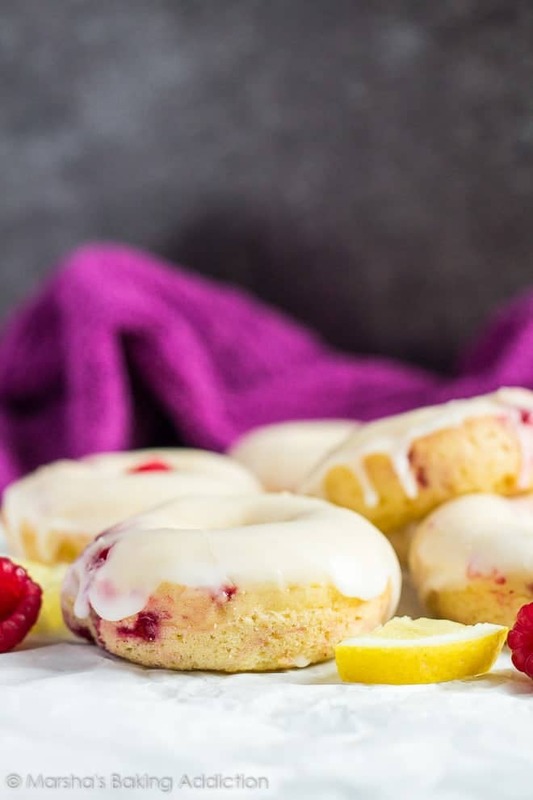 Deliciously moist and fluffy doughnuts infused with lemon, stuffed with raspberries, and dipped in a sweet lemon glaze! Preheat the oven to 180C/350F/Gas 4. Grease a doughnut pan, and set aside. Whisk together the egg, sugar, vanilla, milk, yogurt, oil, lemon juice, and zest until combined. Pour the wet ingredients into the dry ingredients, and mix until just combined. The batter will be quite thick. Gently fold in the raspberries, letting them break up as you mix. Do not overmix. Spoon the batter into the prepared doughnut pan and smooth out the tops. Fill to the top for nice, thick doughnuts. Bake for 7 - 10 minutes or until a toothpick inserted comes out clean. Allow to cool for 5 minutes before transferring them to a wire rack to cool completely. Whisk together the icing sugar, lemon juice, vanilla, and milk until smooth and combined. Use 1 tablespoon of milk for a thicker glaze, or 2 tablespoons for a thinner glaze. Dip each doughnut into the glaze, and leave to set on the wire rack. Leftover doughnuts can be stored in an airtight container at room temperature or in the fridge for up to 2 days. They also freeze well for up to 2 months. Thaw overnight in the fridge before serving. 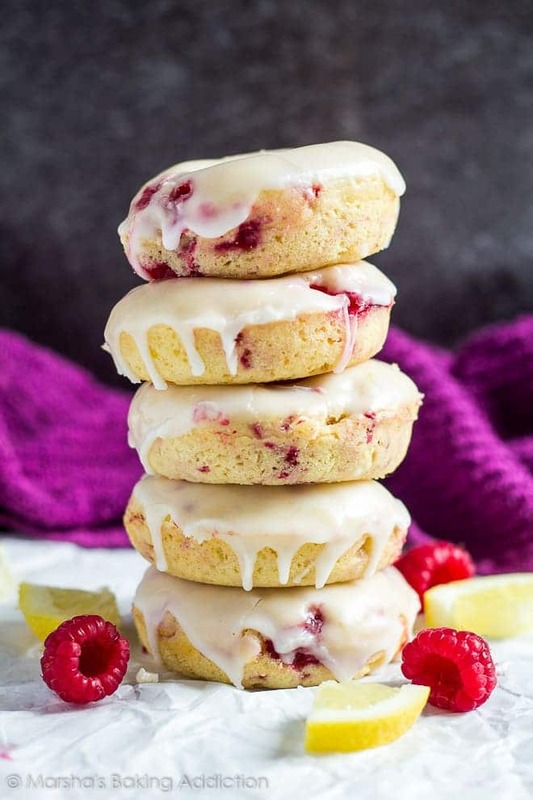 I love the combination of lemon and raspberry! These sound so delicious! 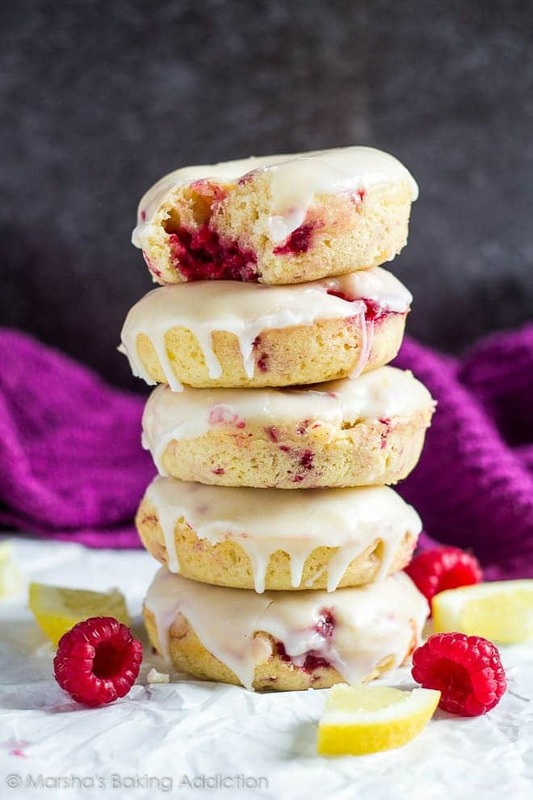 I’ve never had lemon flavoured doughnuts..raspberry and lemon combo sounds yummy. What a beautiful summer snack! I love it when baked goods like this use real berries instead of jam/jelly. Makes them taste so much better! Yum! I’m into doughnuts too at the moment, yours look scrumptious! I am always looking for new recipes to try! WOWZERS, these look great!! 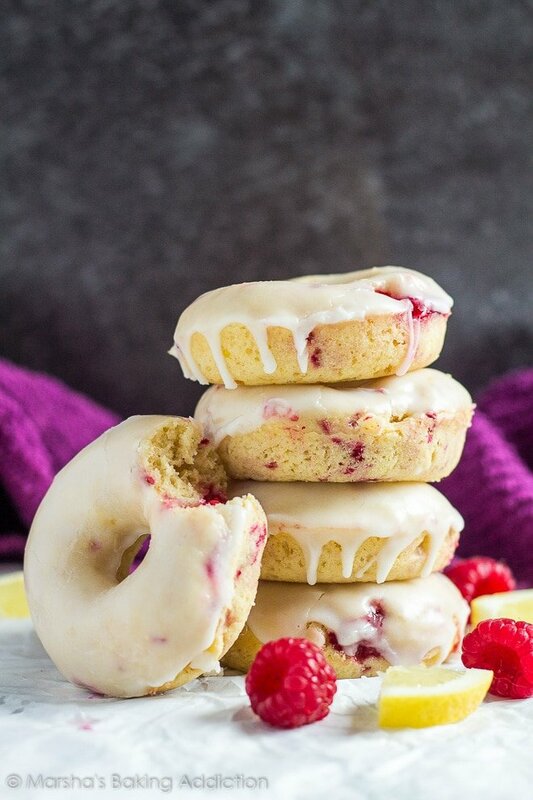 I LOVE doughnuts and these look amazing! And your photos are beautiful – love the purple behind the doughnuts–totally pops! I love doughnuts. It’s so tempting and I feel like gobbling up everyone of those pieces that I see. Lovely sharing Marsha.Pinned!!! Can I sub. thawed frozen raspberries?